Arbor Day and Earth Day happen each April. This year Arbor day is April 28 and Earth Day is April 22. Both offer an opportunity for us to step back and enjoy our natural world. Arbor Day was founded about 145 years ago in Nebraska, on April 10, 1872, after much urging from Julius Sterling Morton, a journalist and member of the Nebraska Board of Agriculture. Morton got the board to approve a plan to give prizes to those who planted the most trees in each county on that day. In a state that badly needed trees, the project was immediately successful. For its early leadership in tree planting, Nebraska became known as "The Tree Planter's State." Millions of living trees planted on Arbor Day throughout the nation affirm the wisdom of Morton's vision. Today all of the 50 states, plus Guam, Puerto Rico, and the Virgin Islands, recognize Arbor Day, though the dates are different to suit the best planting season. Planting a tree is a rewarding task that shows your concern for our environment. The beginning of the environmental movement in the United States originated with Earth Day on April 22, 1979. On that date, approximately 12,000 schools, colleges, and universities and over 20 million Americans took a visible stand on environmental issues. Out of that massive demonstration of public concern came the Federal Clean Air and Clean Water Acts and the establishment of the Environmental Protection Agency. Since then our nation continues to be more aware of environmental issues. We have technologies more capable of dealing with pollution, and an enhanced understanding of how people impact the world upon which it depends. However, after nearly forty years, significant environmental challenges still face mankind and the future of our planet earth. This is where YOU come in! Every human being impacts the earth and its valuable natural resources of the soil, air, water, plants, and animals as a part of our daily life. It is our choice to use and protect these resources or to abuse and destroy the quality of these resources. Everyone can join in on Earth and/or Arbor Days! 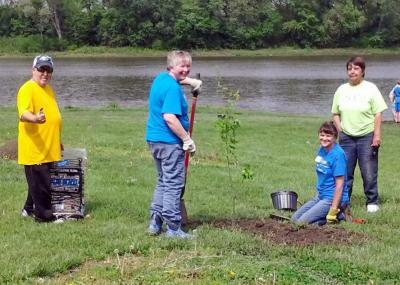 Plant trees as part of a community project, or park district effort where you work and at home. Organize an environmental celebration at your county fairgrounds, city park, or downtown shopping area. Work with your church and local minister to include environmental stewardship as part of the worship service. Begin or expand community waste reduction and recycling programs.